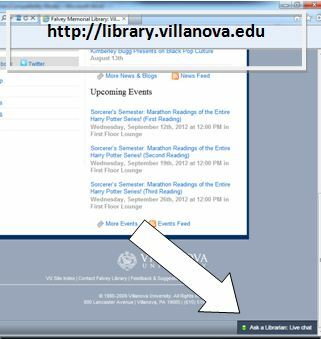 Falvey Memorial Library :: Need expert help with your research project? Falvey’s librarians can help! Need expert help with your research project? Falvey’s librarians can help! Librarians are available to help with your research needs. You will find their offices located on the library second floor (Rooms 220-230) in the Research Center of the Learning Commons. You may contact them in a variety of ways: in-person, chat, phone and email. Whether you are in the building or elsewhere, you can call a librarian at 610-519-4273 or email a librarian at ref@villanova.edu. In Person: Much like faculty, librarians maintain office hours during the week and are available on Sundays. During office hours you can walk right into the Library and request to see the on call librarian immediately. You can also contact a subject librarian directly to set up an appointment. For more information, go to the Contact Us library web page. Kimberley Bugg is the Information and Research Assistance team leader.